The Getty Conservation Institute in Los Angeles has created a new web-based tracking system for archaeological sites in Jordan. Financed in part by the World Monuments Fund and with extensive support from the Jordanian Department of Antiquities, the million dollar project has been in the works for 3 years and will be available for authorized users starting in September. 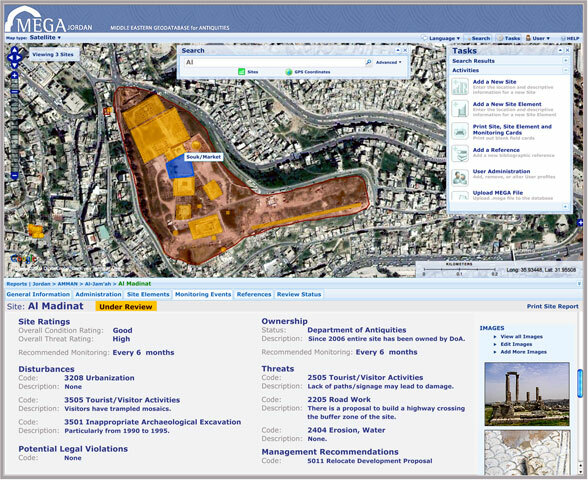 Awesomely named MEGA — Middle Eastern Geodatabase for Antiquities — the database uses Google Earth satellite images and archaeologist field reports to catalogue over 10,000 ancient sites in Jordan. Some of the information was available in a local Jordanian database, but it wasn’t web-based and was clunky to browse and update. Now anybody in the know can easily record any news about a site’s condition, from encroaching development, looters, environmental threats, whatever is relevant. Obviously real-time updates are not going to stop someone from looting a site, but it will help authorities track problems almost as soon as they happen, and get a better idea of how to apportion protection and conservation resources. It was the devastation of Iraq’s archaeological sites in the wake of the US invasion that actually inspired this project. The looting of the National Museum in Baghdad got much of the attention at the time, but the Getty thought they could devise a database to help authorities cope with the archaeological sites being destroyed by looters. Unfortunately, the chaos in the country over the next few years kept the Getty from being able to work with local Iraqi experts, so the project never got off the ground. “The idea of shipping a couple of big computers to Iraq and hoping that they would get there and that it would all work just seemed too crazy,” said Alison Dalgity, a senior project manager at the Getty who helped develop MEGA. And so the institute accepted an invitation from Jordan to develop the system there first, a plan that coincided with a sea change in Web-based mapping tools and the rise of open-source software, meaning that the system could exist on the Web and be built and updated cheaply. It’s not even live yet, but already Jordanian authorities are so delighted with the database that they’re considering opening it to everyone, not just authorized experts but tourist schmoes like the rest of us. Jordan isn’t exactly comfortable with open information sharing when it comes to official government data, so it says a lot that they’re seriously considering upending their customary attitude towards transparency to share the wealth of their archaeological sites. Jordan’s experience with MEGA might be something of a template for Iraq and other antiquities-rich countries. Change the Google settings and the names, and then it’s just a matter of data entry.